(T) An inventory of 1,000 pound bails ready to be shipped. (B) Steve Baseman in front of 45kg bales of top quality, sorted and graded clothing, ready for sale. Tiara Trading, LLC, is your source of high-quality, mixed, used clothing for export and resale. Stephen Baseman and Joe Zigulich build long-term relationships with honest and trustworthy sorters and graders and U.S suppliers. We choose only the best quality garments and inspect the merchandise before we buy it. We encourage you to do the same. 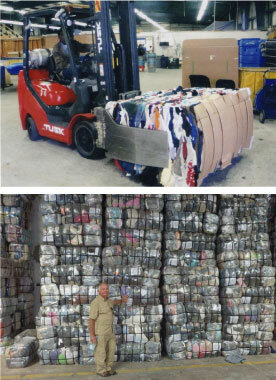 Visit our warehouse and shipping docks in West Florida and watch your garments being loaded. Your second, third and fourth order are just as important to us as your first order. What you see with Tiara Trading is what you get. 1.Our open door policy means no surprises! Meet us and inspect our merchandise before you place an order. 2.Your satisfaction is guaranteed. We measure our success by your success. We are not satisfied until you are. 3.We do business the old-fashioned way. We return your phone calls promptly. Hablamos Espanol. Pregunte por Ronnie Vangas. Por favor llame con sus preguntas.